After sending out a press release, you’ll want to prepare for your own follow-up calls, incoming questions and other contact with editors and members of the media. Here are a few commonsense tips to help ready you and the primary press contact you’ve included in your release. Some of us feel more comfortable allowing all inquiries to go to voicemail to allow a few minutes of preparation. If that sounds like a good strategy for you, be sure to return any calls promptly, but when you’re composed and ready. This approach may also frustrate some inquiries, causing you to miss an opportunity. Before answering any questions, try to ascertain and make note of the reporter’s name and direct contact information, as well as the name of the media outlet or publication. AND, it’s a good idea to ask if the reporter is working on a deadline. Reporters are often pressed for time. Keep calm and be factual. If it’s not immediately apparent, ask if the reporter is writing a particular story. The reporter may simply be verifying some of the facts found in the press release, or she may be working on a story for which your insight would be helpful. It’s okay to ask about the focus of the story; ask in which section of the publication or broadcast it will ultimately appear; and, ask when it will run. It’s typically not okay to ask if you can review the story before it runs. Make a list of talking points and sources for yourself. Include background information on the company. Have a calendar handy in case the reporter would like to interview you or another person mentioned in your news story – you’ll want to schedule the interview with limited back and forth. 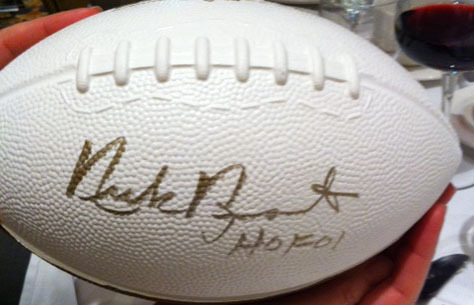 January 30, 2014 – It was great to be in the audience to hear two-time World Champion and NFL Hall-of-Famer, Nick Buoniconti, give an inspired keynote address during Thursday night’s BioNJ Annual Dinner Meeting. He received a standing ovation from the crowd of nearly 700 after talking about everything from locker room pranks involving an alligator in the shower, to the devastating neck dislocation that his son, Marc, sustained while playing for The Citadel in 1985. That injury left Marc paralyzed and changed the course of their lives. Nick has dedicated much of his post-football life to advocating for patients with spinal cord injuries. He founded The Miami Project to Cure Paralysis and serves as its national spokesman. He ended his address by saying that he’d give back all his accolades, and trade all his accomplishments, for a hug from his son. We’re privileged to work with a good number of clients in biotechnology, life sciences, pharma, medical device and healthcare. We often help them translate scientific information about their innovations and technologies into stories that resonate with a more business-centric audience; communicate their services and best healthcare practices to patients and their families; or, bring details about new technologies or medical approaches to physicians. It’s very inspiring work. It was a pleasure to serve as Design Sponsor for the BioNJ Annual Dinner, to provide design services for the event communications and program, and to have one of our principals, Deanne Napurano, serve on the BioNJ Annual Dinner Meeting Committee. If you’ve been feeling overwhelmed, even confused, about where to focus your marketing energy, you’re not alone. The options seem unlimited. Just ten years ago, a fine strategy for a business owner’s marketing and promotional plan likely included some direct mail, print, broadcast and outdoor advertising options, some type of community outreach program, compelling sales materials, and a brochure-style website. Today, we can engage with prospective customers almost anywhere, so businesses include interactive websites, blogs, mobile apps, social media, digital advertising, video channels, email campaigns and more. Luckily for most of us, just because we can [try to] do it all, doesn’t mean we should. It’s very easy to spread yourself too thin, which can actually dilute your message, reach fewer customers and exhaust you in the process. Where do you start and how do you select the most appropriate avenues for your business? How do you do it with clarity and confidence? First and foremost, be selective. Be critical and objective. Don’t be dazzled by analytics unless you’re seeing an impact on your bottom line. Make a plan. Build your plan on a foundation of the basics. Make sure you keep your core vision in mind. What do you do for your customers? Who are they? Why do they choose you over others? Interested in a guide to help market your business? 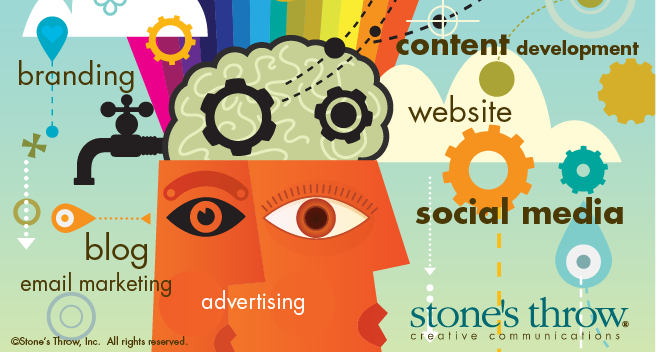 For a modest fee, Stone’s Throw provides MarketingCare, a custom marketing plan roadmap to get you started. Click here to learn more, or contact Deanne at 609-395-0650.
Who are you, personally? How do others get to know you? Whether we like it or not, studies continue to show that many people make some immediate assumptions about us based on our physical appearance and our sense of style (especially our shoes, apparently). * They understand even more when they hear us speak and listen to what we say. They compare what they see and hear to our actions – how do we behave toward our families? The community? We each shape our personal identities, knowingly or unknowingly, fairly or unfairly, through the choices we make and what we show the world around us. Similarly, your company’s identity – how it’s perceived by customers, vendors and the community – is in great part defined by its look (branding), its language (communications) and its actions (behavior). 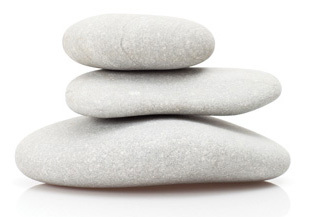 It should embody your company’s mission and values. It should also have a memorable visual component and a clear voice. When you see your company’s logo, read its tagline and core messaging, and review its print and online content, does it all reflect your company well? If it’s no longer in sync with where your company stands today (or where you’d like it to be tomorrow), perhaps it’s time to refresh or recreate your company identity. How long has it been since you went through this process? Talk with your team about your company culture, your motivators and your goals for the future. What business are you in, and why? We find that asking these questions during a workshop-style meeting can yield very good results. Whether we help you facilitate the meeting or not, talking about what defines your business typically uncovers hidden obstacles and new thinking, and can clear the way for more than a new logo – it can clear the way for growth. What’s your business’s history? Who are your clients? What do you do for your clients that no other provider does? Building a strategy begins with asking the right questions and being brutally honest with your answers. Keep your customers in mind. No matter where the process of recreating your company identity takes you, ensure that everything you do focuses on your clients and partners. Test your results by asking: Will our ideal client understand our message and tone – immediately? Working with a well-regarded, ninety-year-old law firm, Stone’s Throw was able to help guide the process of rebranding, beginning with garnering communications strategy planning feedback from each member of the executive team. We then distilled the team’s contributions into a communications strategy summary that was used to build consensus and set guidelines for the creative. With the strategy approved by the executive team, we worked with a smaller marketing committee to set priorities and keep things moving. 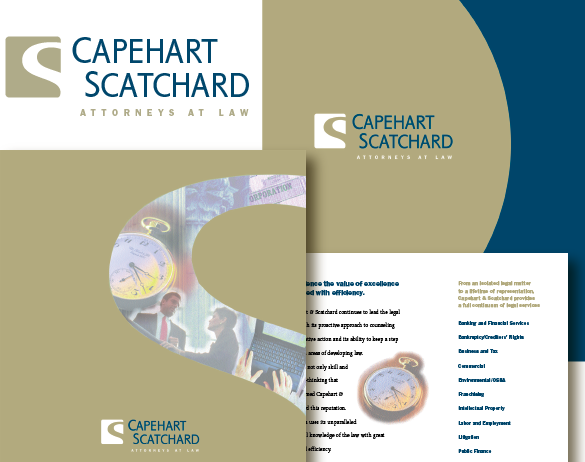 In so doing we worked closely with the law firm’s marketing director to create a new company identity, including logo, stationery system and collateral materials (firm overview brochure, practice area brochures and more). We helped foster understanding and enthusiasm among the entire staff by writing and designing communications that clearly explained the new company identity, how it would be implemented and why. Making the link between a new company logo (the company’s public face) and the company’s evolved culture and attitude toward its clients enabled the staff to rally behind the new identity. * Studies cite height, weight, posture, grooming and clothing as some of the first filters people use to assess someone’s competence and trustworthiness (among other qualities). Hire an ad agency or DIY? A journalist for a local business publication asked us if smaller companies should hire ad agencies. Well, that certainly got us talking. Of course, we shouldn’t make sweeping generalizations, but we can address some of the issues smaller businesses should consider before they reach out for help. A small business typically doesn’t employ someone dedicated to its marketing efforts, so it often makes sense to hire a specialist … for some things. You can then employ the best talent, at competitive costs, just when you need it – similar to how a small business might hire an accountant or other professional service provider. Use your time to leverage your expertise to generate income for your business. Use someone else’s time to leverage their expertise on your behalf. If you think you can’t afford to hire comprehensive marketing and creative support, get picky. Hire a marketing professional only to help you develop a promotional plan or strategy, then consider what can be handled well internally and what would benefit from objective creative or professional execution. If you have a brand and a plan, and can follow style guidelines set by your professionals, you can choose to get help when it will really pay off. When we work with clients, we provide flexibility when it’s needed. We’ll create structures that help to ensure the success of what a client produces in-house. For example, we’ll provide advertising and presentation templates, easy-to-follow style guidelines, and content management training for website maintenance and blog updates. Any quality partner should offer you a similar working relationship. Get your important marketing communications done well. Not that everything isn’t important, but some communications have much greater visibility, or are finely tuned to target a specific subset of your market, and will suggest that you’ve made an investment in yourself (or that you haven’t). That’s something that has the potential to breed confidence in your customers. Those communications will likely include your brand identity and your advertising style and core messaging — the pieces you’ll want to get right, right from the start. – Does the necessary talent exist internally? – Will handling this project internally put a strain on our resources? – Will I have more or less control over the project? – Will the project benefit from objectivity? If your answers point you to finding outside help, it’s time to take a look at available marketing and creative service providers. Use your Chamber directory. Ask colleagues and friends for recommendations. If you search online, don’t simply review a firm’s portfolio, look for client recommendations. Interview the firms that appeal to you and ask for a proposal or estimate, just as you would for other services. That will help you understand the firm’s approach and give you an idea of what it’s like to work with them. Read the interview with Stone’s Throw’s Deanne Napurano in Mercer Business magazine. How do you determine its value? When we launched our business in 1991, the economic climate felt eerily similar to what we’re feeling today. Circumstances are different, but even a casual observer can see a familiar reticence when it comes to organizations spending on new programs, new marketing initiatives. Some companies are bringing the creation and production of their marketing and sales tools back in-house hoping to reduce costs, but are finding that the process, the resulting materials and their effectiveness may not be what they bargained for. Some of our clients have found the following Creative Business article helpful in determining the value of contracting outside creative services. It is relatively easy for an organization to determine the true cost of manufactured goods – a combination of raw material, fabrication, marketing and distribution, labor, and overhead costs. Much more difficult to determine is the true cost of services. Services are labor-intensive, not capital-intensive; their value lies not so much in what they provide today as in what they contribute to the future; and comparison and evaluation is always qualitative, seldom quantitative. Here are some things to consider when evaluating how to handle your organization’s requirements for creative services. Being efficient and competitive in today’s global economy not only requires an organization to utilize the most sophisticated of resources, but also to maintain a high degree of flexibility. The only way to accomplish both cost-effectively is to employ a core staff of managers, and to supplement them with trusted outside specialists when required. This way, it is possible to employ the best possible talent at competitive costs. Specifically, when it comes to creative services, it is nearly impossible for any organization to employ enough talented individuals – writers, graphic designers, illustrators, and photographers – to handle its many different communications needs internally. On the surface, utilizing outside vendors often seems exorbitantly costly. In fact, however, they are usually very cost-competitive, and may even be less expensive than attempting to handle the same work internally. The reason for the appearance of high cost is that corporate bookkeeping practices and internal budget transfers seldom reflect the true cost of internal labor. Most commonly, internal department cross-charges only accommodate actual payroll expenses with a small factor thrown in for overhead expenses. When all costs – salaries, benefits, and overhead – are included, studies have shown that charges for outside creative vendors actually average about 5% less than the same work done internally. Also important to consider is that except for the smallest of jobs, creative fees are always a small fraction of total job costs. Even when apparent (as opposed to real) costs are the basis for calculation, the incremental increase in creative costs attributable to going outside is seldom more than 5% to 10% on a small brochure or ad, or less than 1% on a major corporate brochure. Keeping creative work inside for budget reasons seldom stands up to scrutiny. Does the necessary talent exist internally? Some communications challenges take special talent, some don’t. But when talent is truly required, it seldom pays to compromise. Using well-meaning but unqualified internal staff can be very expensive in the long run – in lost efficiency and in market impact. And computers with specialized software are never any better than the talent and experience of those operating them. When effectiveness is critically important, hiring an outside specialist is always the least expensive and most productive alternative. Will handling it internally put a strain on resources? The disruptive cost of handling an unusual or special assignment can cause havoc when staff are already overloaded. When faced with a special assignment, employees typically either give it low priority, in which case it is handled poorly, or they dedicate themselves to it, in which case their regular work suffers. Unless your staff is visible underutilized, always handle special assignments outside. Will there be more or less control? This question is not as simple to answer as it may appear. Despite appearances to the contrary, work handled inside is usually less controllable because it is difficult to assign tough deadlines, make unpopular changes and be honestly critical. In even the best-run organizations, office politics and turf battles are a plague to productivity. When you absolutely, positively have to have it done, your way and on schedule, hire an outside vendor. Will the project benefit from objectivity? Some communications challenges absolutely require it. For others it is not critical. You decide. If you are looking for a fresh viewpoint, however, keep in mind how difficult it is for anyone working close to the product, or within the sponsoring organization, to recognize distinctive, customer-appealing elements. 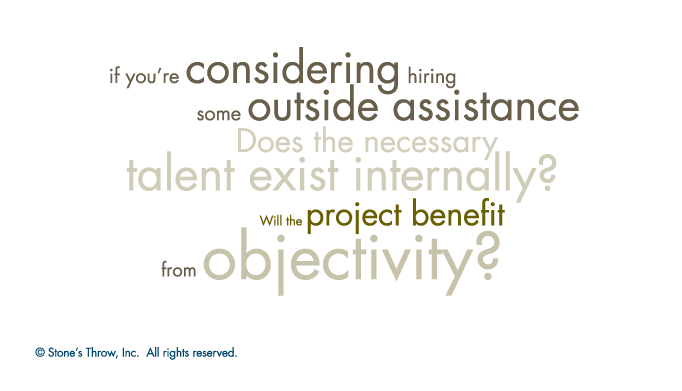 If objectivity is important, hire an objective, outside resources. When it comes to ensuring that we create on-target marketing materials, my partner and I have always employed what has been called the Q Strategy. We build a company backgrounder, craft a communications strategy, and then judge all creative by that strategy before presenting it to the client. We gather most of the information needed for this process by questioning the client’s marketing manager or business development director, and other key personnel or decision makers. Surprising to some, tone often trumps “features, advantages and benefits” when it comes to manifesting the client’s compelling story from lists of marketing objectives. Yes, preliminary conversations with clients often center around how a product or service increases the good stuff, decreases the bad stuff, and does it all more effectively and efficiently. This is necessary and informative. But clients really come to life, and the story begins to take shape, when we start to talk about tone, personality, and the single most important feeling they want their customers to take away from their new messaging. In fact, it’s during this part of an input meeting when I often sketch concept ideas and write the first lines of rough copy in the margins of my notepad. During a client-agency creative session back in the 90s I listened intently as my client was describing the “type” of advertising he thought would work for his company. Later, when I examined my notes, I found his list of descriptive words numbered over three dozen. Many of them contradictory: something awesome, something soft-sell, something clever, something technical, something humorous, etc. 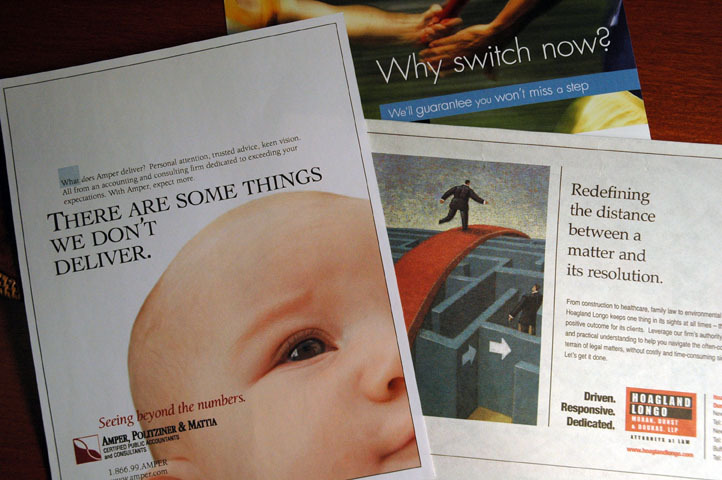 What occurred to me is that there are many ways to create effective advertising, but very often it is the character of the ads that gets the client’s nod or the wastebasket. • Did You Know These Facts? • You Shouldn’t Have To Put Up With This!